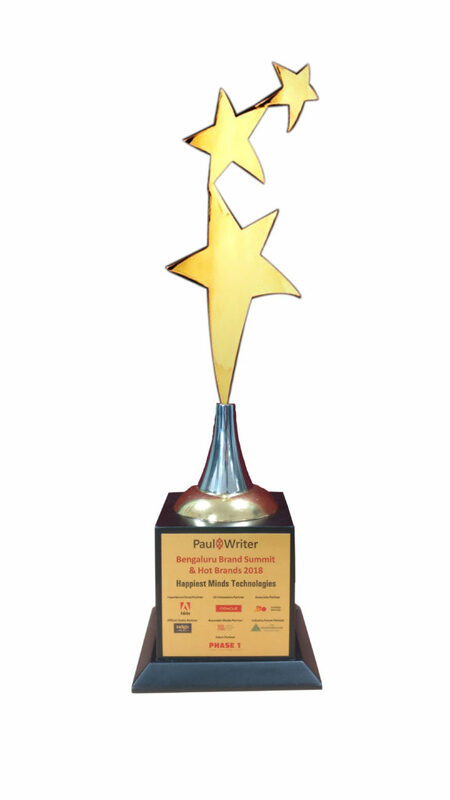 Paul Writer recognized Happiest Minds as a Hot 50 Brand under the Customer Experience Champion category. 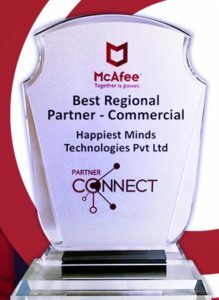 Happiest Minds Technologies wins McAfee Partner Award for excellence in engaging premier customers in commercial segment for large value annuity deals. 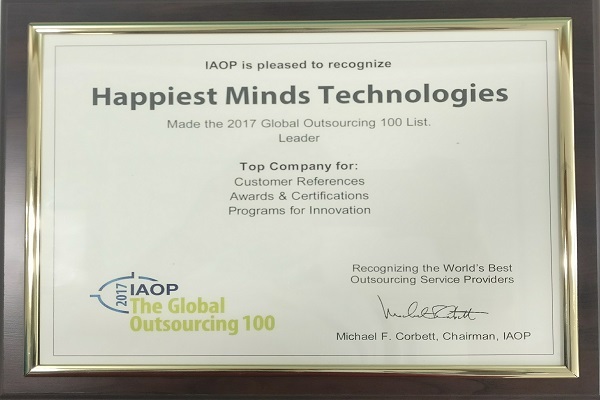 Happiest Minds is a ‘Leader’ in the IAOP Global Outsourcing 100 List 2017′. iSaaS - Integrated Security-as-a-Service v1.5 of Happiest Minds Technologies was the silver winner at the 2016 Network Products Guide under the category 'Unified or Integrated Security'. 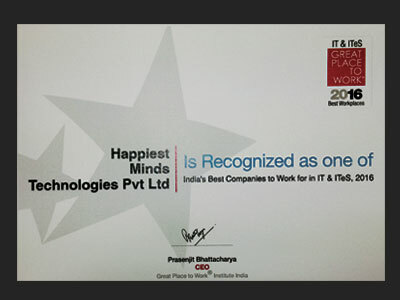 Ashok Soota, Founder Happiest Minds Technologies, honoured with the I.T. 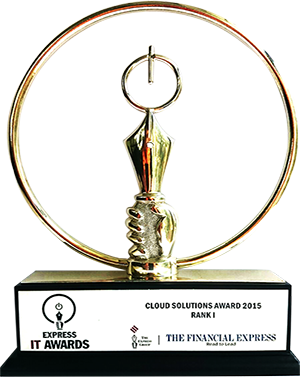 Lifetime Achievement Award by Fin Express during the Express I.T. Awards 2016 ceremony. Darshan Appayanna, Vice President-Corporate, receives the IDC Insights Awards 2016 - Excellence in Omni Experience. 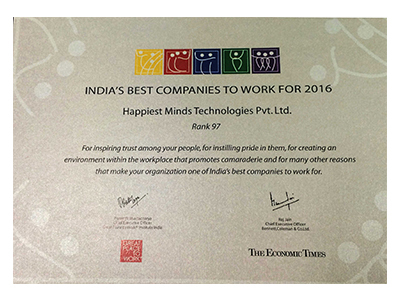 Happiest Minds Technologies is in India’s Best Companies to Work for 2016 list. 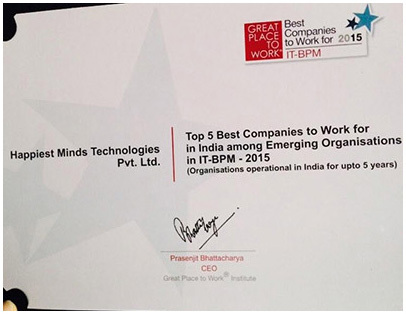 The study was jointly commissioned by The Economic Times and the Great Place to Work® Institute. ClickASTRA is a unique solution developed by Happiest Minds for analyzing clickstream data from websites. It transforms the semi structured clickstream data into actionable business intelligence. Clickstream data can help reveal insightful and actionable information to tailor the website experience for a specific user based on their site interaction. 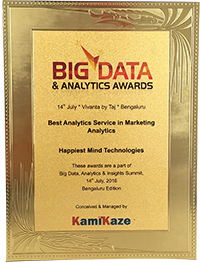 Happiest Minds Personalization & Recommendation solution wins in the category Best Analytics Service in Marketing Analytics at Big Data, Analytics & Insights Summit. Happiest Minds’ product recommendation engine understands the customer preferences and intent based on the customer visits and shows the most relevant recommendation type and products in near real time. As the engine learns more about each visitor, the recommendation also improves which enable to make the shopping experience more personal and inspiring. The recommendation engine provides both product to product and customer to product recommendation on near real time basis. 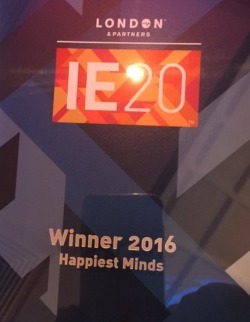 Happiest Minds has been recognized by IAOP as a “Rising Star"
Happiest Minds is selected as India’s top emerging global company in the 2016 India Emerging 20 programme. The award showcases twenty of India’s most dynamic businesses with a unique opportunity to win recognition on the international stage in London. The winners are from a broad range of categories including life sciences, artificial intelligence, IT services, cyber security, sports tech, travel tech, adtech, e-commerce and analytics. 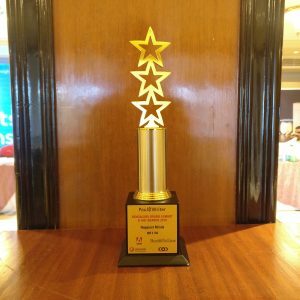 Happiest Minds wins GOLD at the InfoSecurity Product Guide’s Global Excellence Award 2016. 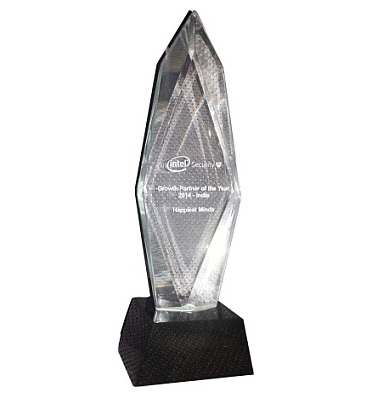 Info Security Products Guide, the industry's leading information security research and advisory guide, has named ThreatVigil (a cloud based threat management solution), a GOLD winner of the 2016 Global Excellence Awards® in the Vulnerability Assessment, Remediation and Management Category. The Info Security Products Guide Global Excellence Awards recognize and honor excellence in all areas of information security. More than 50 judges from a broad spectrum of industry voices from around the world participated and their average scores determined the 2016 Global Excellence Awards Finalists and Winners. 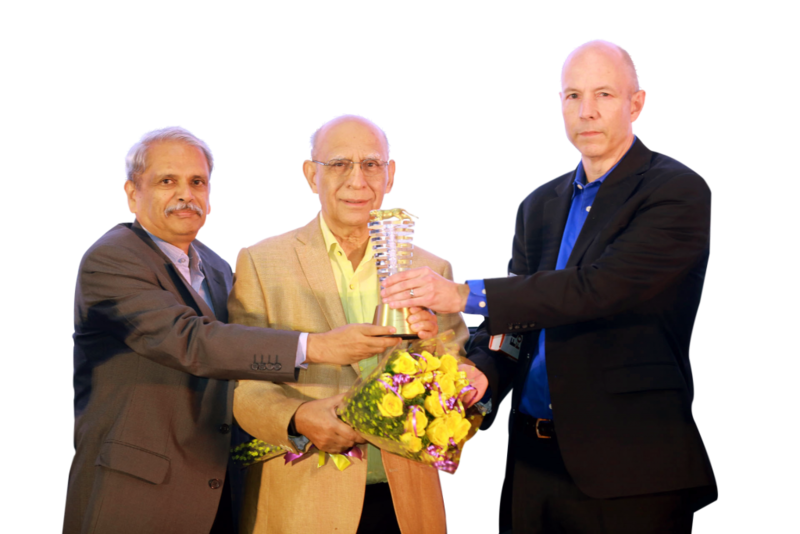 Ashok Soota, Founder Happiest Minds Technologies, honoured with Agile Lifetime Achievement Award of 2015 (Honorary) by Unicom. 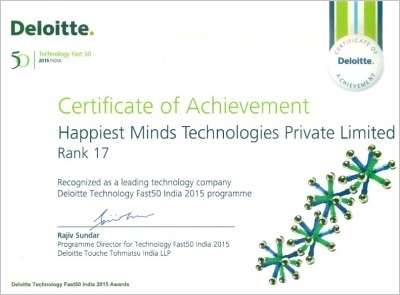 Happiest Minds ranks 17 in The Deloitte Technology Fast 50 India. The Deloitte Technology Fast 50 program in India is to recognize and honor the leading businesses which have huge potential growth. 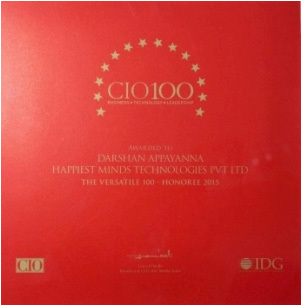 Darshan Appayanna, CIO at Happiest Minds was honored as one of the Versatile 100 honorees at the 10th annual CIO100 award in Pune on 3-4 Sep, 2015. 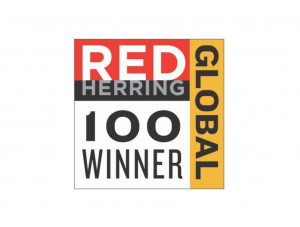 The CIO100 awards recognizes organizations that exemplify the highest level of operational and strategic excellence in information technology. The awards identifies and honors organizations and their CIOs who are not only models of IT innovation and business value delivery but are also fast-responders to rapidly changing conditions in emerging markets, customer demands, and competitive threats. 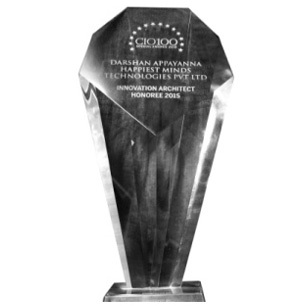 Happiest Minds was also felicitated with the CIO100 Innovation Architect Special Awards 2015. 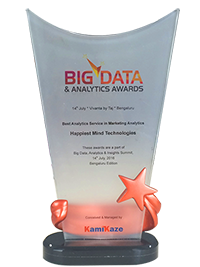 This award identified organizations that have leveraged IT supremely to beat the competition and shaken up the way their industries operate. Winners must demonstrate that their innovative project breaks conventional ideas or processes; that it goes beyond marginal improvements on something that already exists; and that it has had a wide impact. 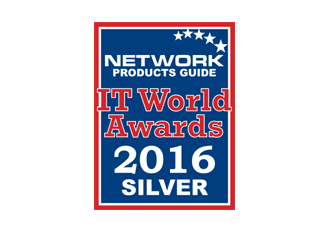 Network Products Guide, industry's leading technology research and advisory guide, has named iTaaS Platform [Gold Winner], ComplianceVigil [Gold Winner] & CyberVigil [Bronze Winner] winners of the 10th Annual 2015 Hot Companies and Best Products Awards in various categories. These industry and peer recognitions from Network Products Guide are the world's premier information technology awards honoring achievements and recognitions in every facet of the IT industry. The iTaaS and ComplianceVigil platforms have been awarded a Gold in the Infrastructure-as-a-Service and Compliance categories respectively. 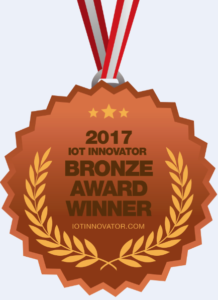 CyberVigil platform has been recognized as a Bronze Winner in the Insider Threat Detection & Solutions category. The case study submitted was: Analytics driven Personalization and Recommendation Engine. 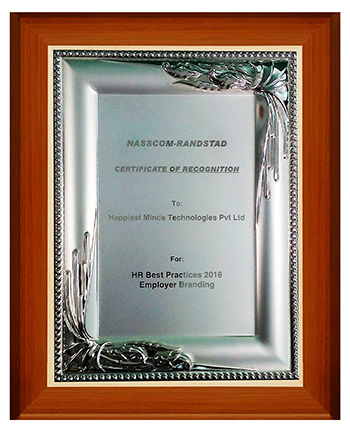 Happiest Minds has been recognized as Bangalore's Hot 50 Brand at the Bangalore Brand Summit 2015.The axes on which brands were evaluated were Growth, Mindshare, Uniqueness, and Innovation. This award is a mark of our commitment and the effort we put in to advance our growth towards the targets that we have set for ourselves. Security Products Guide, the industry's leading information security research and advisory guide, has named CyberVigil, a Gold winner of the 2015 Global Excellence Awards in Innovation in Next Generation Security. 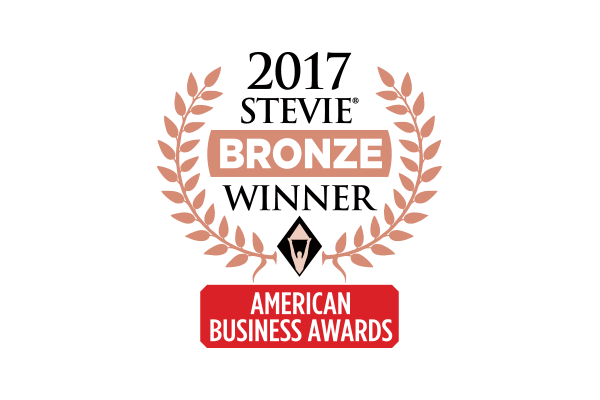 ComplianceVigil & IdentityVigil solutions were recognized as a Bronze Winner in the Compliance & Identity Management categories respectively. The security industry celebrated its 11th Annual 2015 Global Excellence Awards in San Francisco by honoring excellence in every facet of the industry including products, people behind the successes and best companies. CyberVigil platform wins "Gold" at Security Products Guide's 2015 Global Excellence Awards for Innovation in Next Generation Security. ComplianceVigil & IdentityVigil platforms were recognized as a Bronze Winner in the Compliance & Identity Management categories respectively. 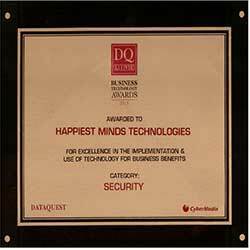 Data Quest presents Happiest Minds a token of appreciation for excellence in implementation and use of technologies for business benefits under its disruptive technology – Cloud and Security. 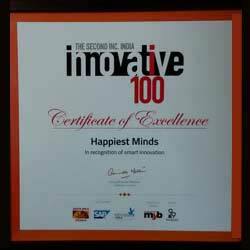 Happiest Minds has been recognized in Inc India's 'Innovative 100' ranking, a prestigious award conferred on India's most innovative mid-sized enterprises by the Inc India magazine. 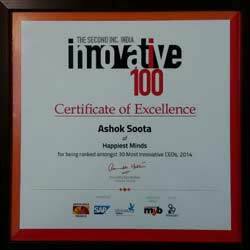 Ashok Soota has also been awarded the Top 30 Most Innovative CEOs. It is a solid external affirmation of our positioning & execution. Technology Fast 500 are a careful selection of large, small, private, public companies around Asia Pacific that spans across a host of industries that are letting their growth rate speak for themselves. 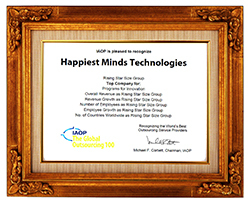 To be enlisted as one of the companies that has topped the Technology Fast 500 APAC is the kind of recognition Happiest Minds can truly take pride in. It goes on to prove that the company's expertise in disruptive technology coupled with its diligent drive can literally transform the way global businesses work today, another feather on the cap for the company. The company makes a mark by ensuring `health and wellness' as an inclusive programme for its employees. Put together by Chestnut Global Partners, a global provider of employee assistance programmes in association with the Society for Human Resources Management India, the rankings were based on a two-tier assessment that took into account criterion such as impact of health and wellness initiatives on the employees; innovation as well as sustainability. 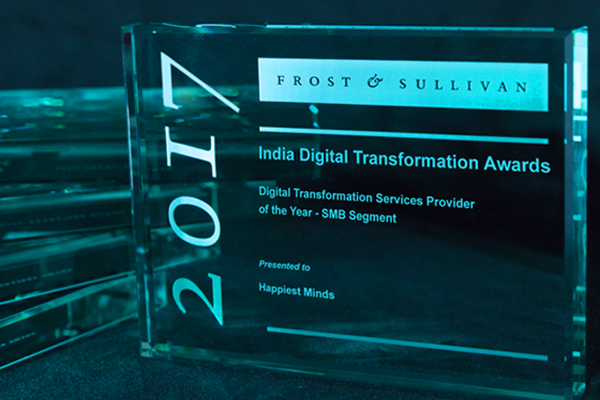 This win is a testimony towards the company's sharp focus on disruptive technologies and a unique wellness centric culture. The ranking is based on the company's 2,377 % revenue growth over the past three years. 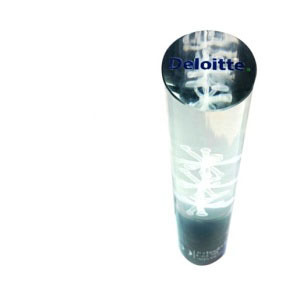 Deloitte is known to recognise and award companies in this category, which have significantly grown over the recent years resulting in carving a niche for itself in a highly competitive and constantly evolving industry. Was named in the 'niche & emerging' zone in the Global Engineering R&D Service Provider [GSPR] Rating (2014) released by Zinnov, a leading globalization and market expansion advisory firm. 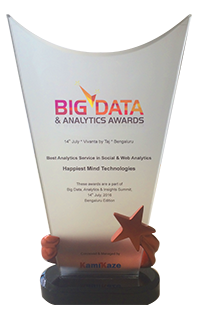 With its constant focus on disruptive technologies and core expertise in SMAC+ areas, Happiest Minds has bagged this honour in just three years since its foundation. 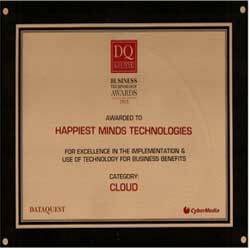 The rating corroborates Happiest Minds' competencies in the consumer and enterprise software verticals. 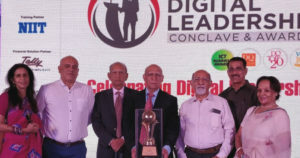 Mr. Soota was recognized for his exemplary contributions to the IT sector–for his vision, creativity, business acumen and technology to lead India towards its higher goal in the field of Information and Technology. This category recognized innovation that helps companies manage and build their brand perception, communicate with their customers, and support them in ways that were previously not possible. 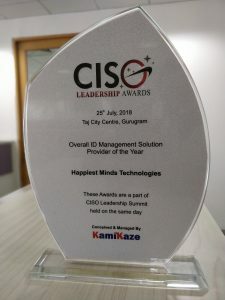 CIO magazine recognized Chief Information Officers (CIOs) and IT leaders from leading Indian organizations for being imaginative and innovative with their IT deployments in difficult economic conditions. 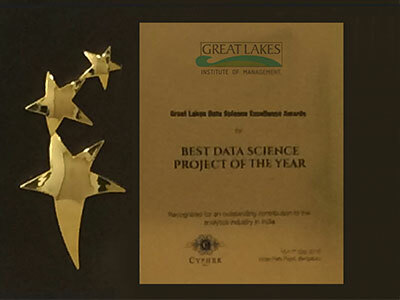 Darshan Appayanna was recognized for SPARKS – a light weight Enterprise Data Integration Hub—that was conceived and developed internally, within a month. 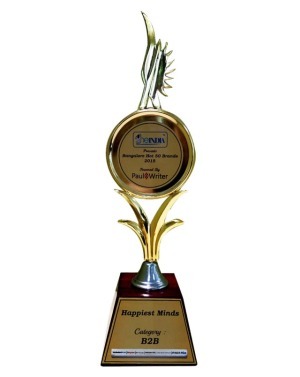 Submission by Happiest Minds on “A novel methodology for handling Document Level Security in search based Applications” was shortlisted in the top 50 papers of Lucene/Solr Revolution 2013. Lucene/Solr Revolution the largest conference dedicated to open source search. The conference provides professional training on Apache Lucene/Solr, as well as a unique opportunity to learn from the search experts in multiple educational tracks. 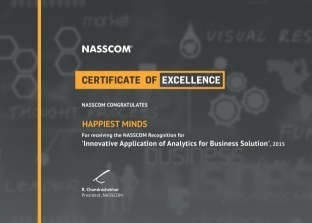 A paper submitted by Happiest Minds professional was selected from amongst 500+ papers put forward by specialists at EMC, its partners and vendors in the area of Big Data, Storage, Cloud and Trust from across the world and won the overall 2nd prize. The HBase Conference is the highest level of technology forum for Apache HBase, sponsored by Cloudera. 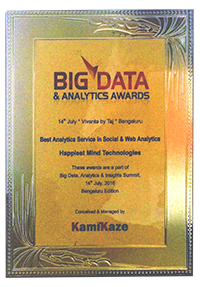 Happiest Minds presented a complex architectural challenge on Big Data search and were able to share the stage with global technology innovators like Google and Facebook. The company has been identified as a sample vendor in three new Gartner Hype Cycle Reports of 2013:, "Hype Cycle for Cloud Services Brokerage, 2013 (1)"; "Hype Cycle for Business Process Management, 2013 (2) and “Hype Cycle for Application Architecture, 2013 (3)” a validation for its strong expertise in newer technologies as well as excellent understanding of client's business needs.